High quality stainless steel locknut and bolt set for attaching freewheel clutch item # FWM-100 and FWM-125 to rear wheel sprocket item # SPR-2555, SPR-2565S, and SPR-2580. Electric scooter, dirt bike, and pocket bike freewheel clutch mechanism for right hand side chains. Freewheel engages in the clockwise directions. 3-1/16" OD x 1-5/16" ID. Works with 2-1/8" (54mm) ID chain sprockets with four bolt mounting pattern. Fits 34mm (1-5/16") OD electric scooter, dirt bike, and pocket bike threaded wheel hubs. 34mm (1-5/16") ID. M35x1.00 right hand threads. Electric scooter, dirt bike, and pocket bike freewheel clutch mechanism with for right hand side chains. This freewheel has four notches for installation and removal with a freewheel tool (sold below). Freewheel engages in the clockwise directions. 3-1/16" OD x 1-5/16" ID. Works with 2-1/8" (54mm) ID chain sprockets with four bolt mounting pattern. Adjacent mounting bolt holes are spaced 47mm (1-3/8") apart from center to center. Fits 34mm (1-5/16") OD electric scooter, dirt bike, and pocket bike threaded wheel hubs. 34mm (1-5/16") ID. M35x1.00 right-hand threads. Electric scooter, dirt bike, and pocket bike freewheel clutch mechanism for right hand side chains. Freewheel engages in the clockwise direction. 3-1/16" OD x 1-5/16" ID. Works with 2-1/8" (54mm) ID chain sprockets with four bolt mounting pattern. This freewheel has 16 teeth and also works with standard single speed 1/2"x1/8" (#410) bicycle chain. Fits 34mm (1-5/16") OD electric scooter, dirt bike, and pocket bike threaded wheel hubs. 34mm (1-5/16") ID. M35x1.00 right-hand threads. Electric bicycle freewheel clutch mechanism for right hand side chains. Freewheel engages in the clockwise direction. 3-1/16" OD x 1-5/16" ID. Works with 2-1/8" (54mm) ID chain sprockets with four bolt mounting pattern. This freewheel has 16 teeth and also works with standard single speed 1/2"x1/8" (#410) bicycle chain. Fits 1-3/8" OD bicycle threaded wheel hubs. 1-5/16" ID. 1.375 x 24 TPI right-hand threads. Electric scooter, dirt bike, and pocket bike freewheel clutch mechanism for left hand side chains. Freewheel engages in the counter clockwise directions. 3-1/16" OD x 1-5/16" ID. Works with 2-1/8" (54mm) ID chain sprockets with four bolt mounting pattern. This freewheel has 16 teeth and also works with standard single speed 1/2"x1/8" (#410) bicycle chain. Fits 35mm (1-3/8") OD electric scooter, dirt bike, and pocket bike threaded wheel hubs. 34mm (1-5/16") ID. M35x1.00 left-hand (counterclockwise) threads. 3-7/8" OD, 1-1/8" ID. 3 bolt mounting pattern. 1/4" bolt hole ID. Adjacent bolt hole center to center distance 33mm. 3-7/8" OD, 1-1/8" ID. 4 bolt mounting pattern. 1/4" bolt hole ID. Adjacent bolt hole center to center distance 27mm. OEM rear sprocket for Lashout® electric bicycle. 4-1/2" OD, 1-1/4" ID. 1/4" bolt hole ID. Universal six bolt disk brake rotor mounting pattern. Adjacent bolt hole center to center distance 22mm. 4-1/2" OD, 1-1/8" ID. 3 bolt mounting pattern. 1/4" bolt hole ID. Adjacent bolt hole center to center distance 33mm. 5-3/8" OD, 1" ID. 3 bolt mounting pattern. 1/4" bolt hole ID. Adjacent bolt hole center to center distance 33mm. 5-3/4" OD, 1" ID. 3 bolt mounting pattern. 1/4" bolt hole ID. Adjacent bolt hole center to center distance 33mm. 3-7/8" OD, 2-1/8" ID. 4 bolt mounting pattern. 1/4" bolt hole ID. This sprocket bolts directly onto 4-hole rear wheel freewheel clutches. 4-1/2" OD, 2-1/8" ID. 4 bolt mounting pattern. 1/4" bolt hole ID. This sprocket bolts directly onto 4-hole rear wheel freewheel clutches. 5-1/2" OD, 2-1/8" ID. 4 bolt mounting pattern. 1/4" bolt hole ID. This sprocket bolts directly onto 4-hole rear wheel freewheel clutches. 6-1/2" OD, 2-1/8" ID. 4 bolt mounting pattern. 1/4" bolt hole ID. This sprocket bolts directly onto 4-hole rear wheel freewheel clutches. 7-1/4" OD, 2-1/8" ID. 4 bolt mounting pattern. 1/4" bolt hole ID. This sprocket bolts directly onto 4-hole rear wheel freewheel clutches. 5-1/2" OD, 1-3/8" ID. 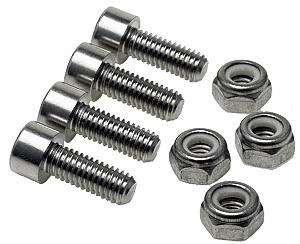 Fits 34mm (1-5/16") OD threaded electric scooter, dirt bike, and pocket bike wheel hubs. M35x1.00 threads. 7-1/4" OD, 34mm (1-5/16") ID. Compatible with eZip, IZIP, GT, Mongoose, Schwinn, and Currie electric scooters. Has ISO threads that fit practically all modern bicycle wheels. 1.375 x 24 TPI right-hand threads. We carry a wide variety of rear wheel sprockets for #25 chain including sprockets that attach to the wheel with bolts, sprockets that attach to the wheel with threads, and sprockets that attach to freewheel clutches with nuts and bolts. We also carry hardware to mount sprockets onto wheels and freewheel clutches. 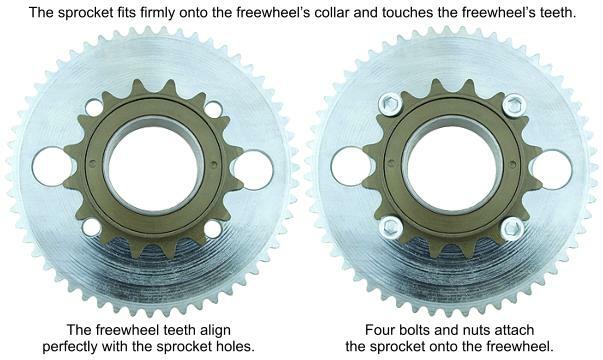 Sprockets that attach to freewheels attach with nuts and bolts and the freewheel has threads that screw onto the wheel hub.